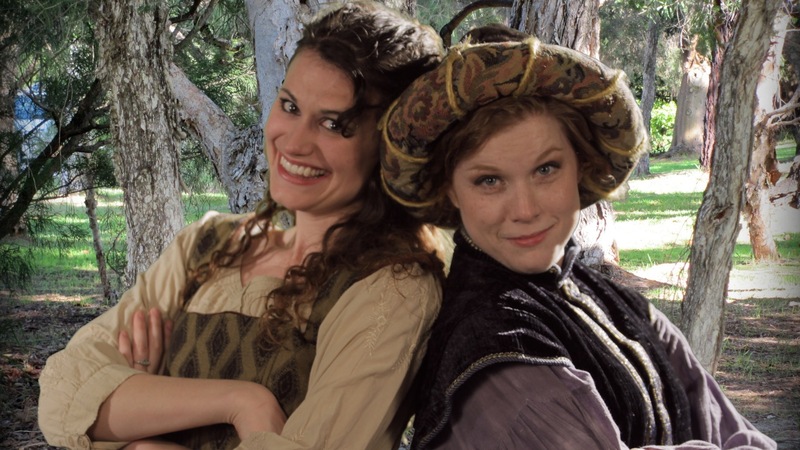 Maggie Murphy and Betsy Bowman star as the go-for-broke cousins in “As You Like It” at St. Louis Shakespeare. The silly nonsense that Shakespeare gave us in “As You Like It” translates as pure fun and magic in the hands of director Brian A. Peters and his lively cast in the St. Louis Shakespeare production. In the Court of Duke Frederick and in the Forest of Arden, the cast plays it for laughs and with the tongue-in-cheek fervor that the Bard had intended. Those two lovely ladies I alluded to in the banner are Betsy Bowman and Maggie Murphy. A more charming pair couldn’t be found. Miss Bowman is a delightful and witty spitfire as Rosalind, the daughter of Duke Senior She decides to disguise herself as a boy, Ganymede, to go in search of her father in the forest where he has been banished and dwells with his own merry band including the court jester, Touchstone. Maggie Murphy is equally wondrous as Celia, daughter of Duke Frederick. Cousins and BFF’s, she decides to travel with Rosalind disguised as her alter ego’s sister, Aliena. Robert Ashton is marvelous as both Dukes with differing dispositions. Aaron Dodd matches the young ladies step for step as Orlando, son of Sir Rowland, Duke Frederick’s arch enemy. When the Duke finds out about this, he bans him from the kingdom and he and his servant Adam (played with panache by Steve Wozniak) set off to- where else- the Forest of Aden. In the forest we’re introduced to a silver-tongued Jacques (Christopher LaBanca) who gets to bring the famous “seven stages of man” speech to us, the funny philosopher Touchstone- played with flair by Tim Callahan, Tasha Zebrowski as the hellcat Phoebe, Michael Pierce as the love-sick Silvius, Elizabeth Breed as the bawdy Audrey and a score of other lords, shepherds and reprobates filling the play with humor and wild, implausible plot lines. Of course, as you might suspect, it all winds up with a happy ending and four typical Shakespearean weddings. Could you ever doubt it? 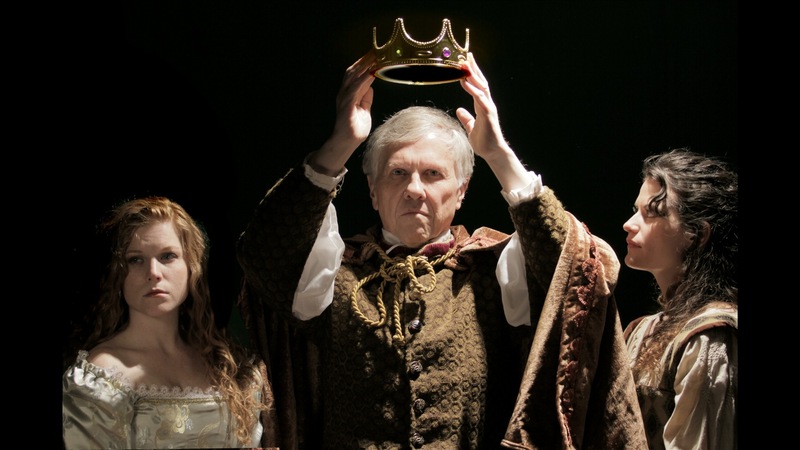 Betsy Bowman, Robert Ashton and Maggie Murphy in “As You Like It” at St. Louis Shakespeare. With the “if I can’t marry you, I’ll marry YOU” mentality and even a couple of adorable goats (smaller than life hand puppets but real scene-stealers), this is a wonderful interpretation of one of Shakespeare’s most light-hearted comedies. The simple yet effective Cristie Johnston set design works into the whole scheme of things with just the right touch of fun and fantasy. Beth Ashby’s costumes and the Jaime Zayas lighting design also add to the feel of the production. Presenting this one on the stage at DeSmet High School in Creve Coeur, St. Louis Shakespeare transforms us to a very special place in Shakespeare’s “As You Like It.” Contact them at 314-361-5664 or at info@stlshakespeare.org for tickets or more information. 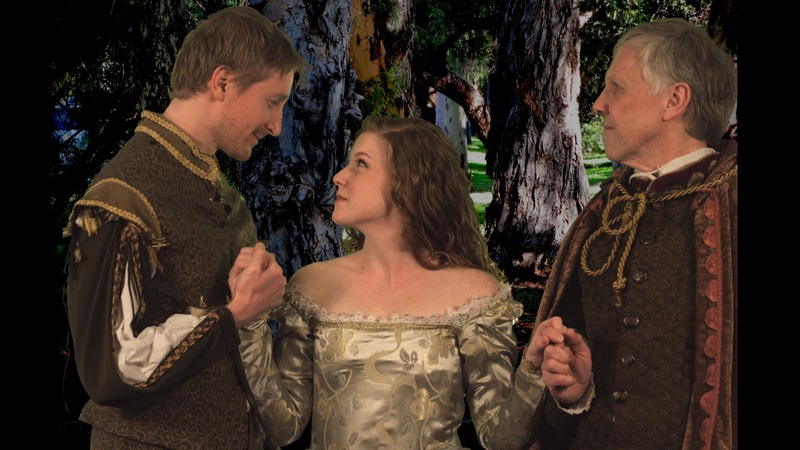 “As You Like It” runs through March 24th.